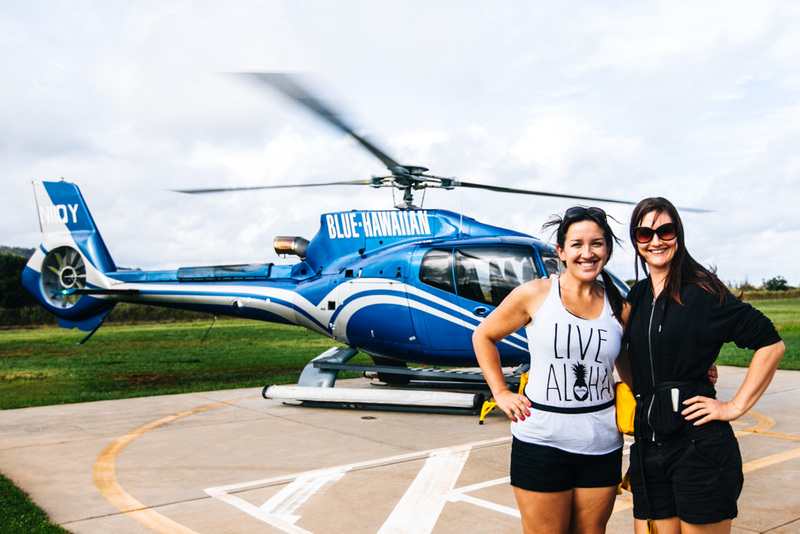 Flying Over Kauai – My First Time In A Helicopter! I can’t believe it took me nearly 32 years to take my first helicopter flight! 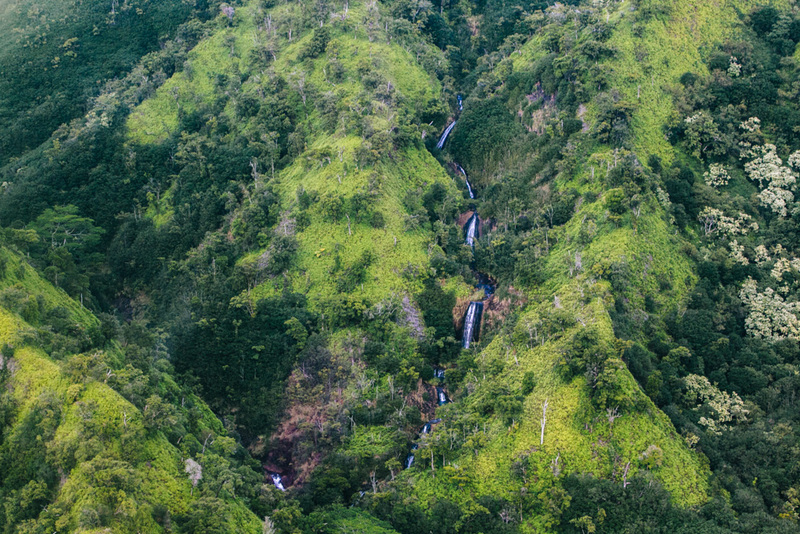 I’ve been lucky enough to take a few scenic flights during my travels (over the Grand Canyon, Great Barrier Reef, and Milford Sound)… but those were all in small planes. 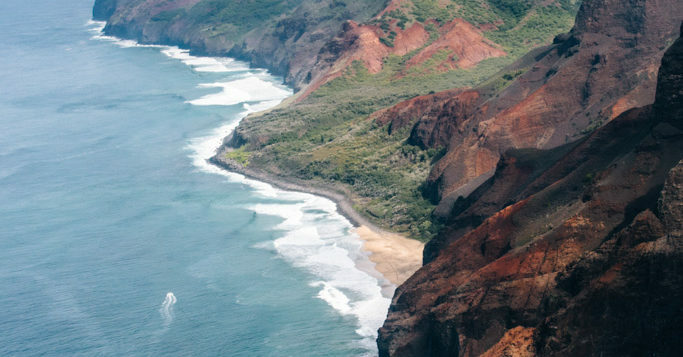 The fact is, scenic flights by helicopter are more expensive than those by airplane. 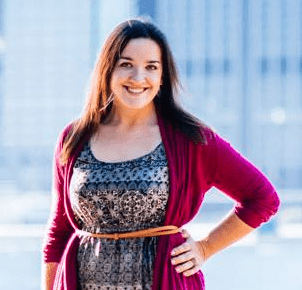 And you know how this frugal gal rolls – why would I pay more for something when I can get basically the same thing paying less? I mean, if a plane and a chopper are covering the same route, you’re gonna see approximately the same sights on either flight, right? That was my reasoning, anyway. But you might also know that I prescribe to the *do the thing you’re supposed to do, in the place you’re supposed to do it* mentality. 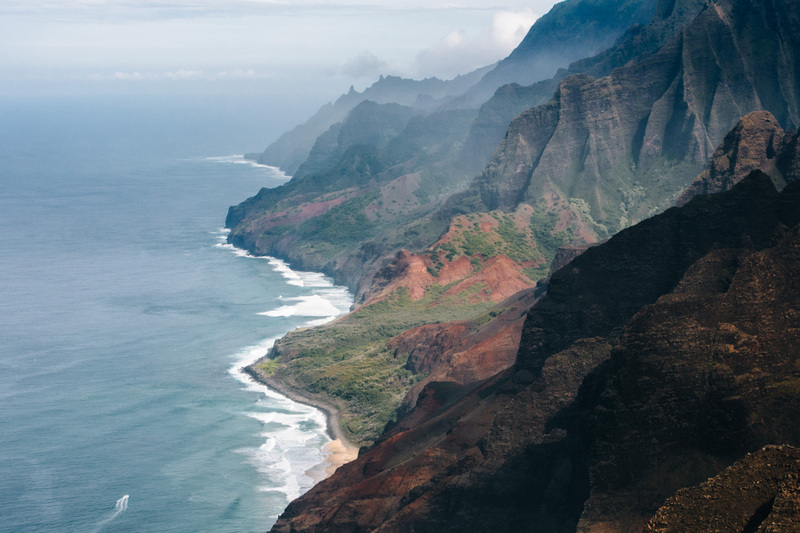 So when I realized that scenic helicopter tours were a major thing on Kauai, I knew straight away that this would be the place I’d pop my helicopter cherry. And guys, it was SO worth the wait. 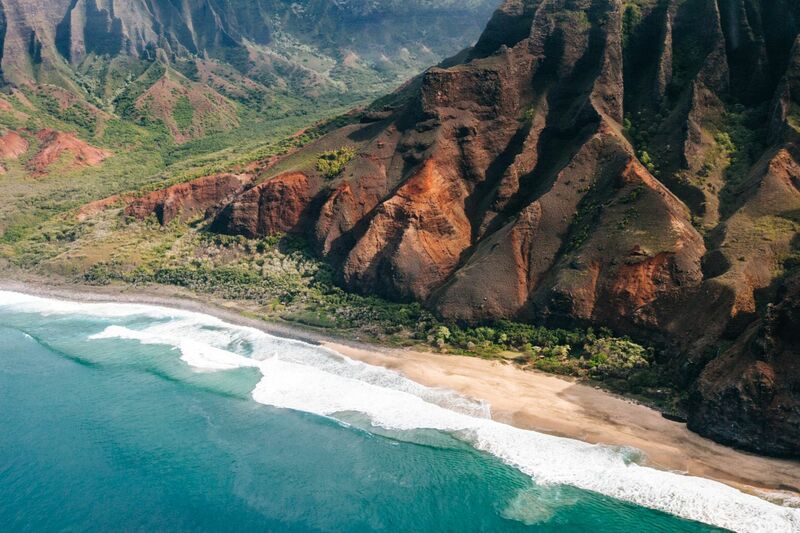 Kauai was made to be to toured in a helicopter. There’s just so much beautiful stuff to be seen from above that you can’t glimpse from the ground. 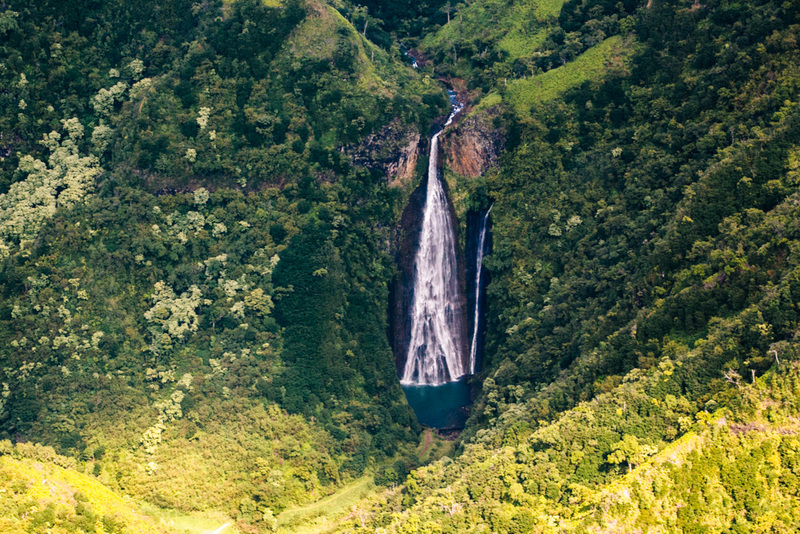 Scenic flights by airplane are offered too, but planes can’t get as close to the waterfalls or enter the valleys like helicopters can. 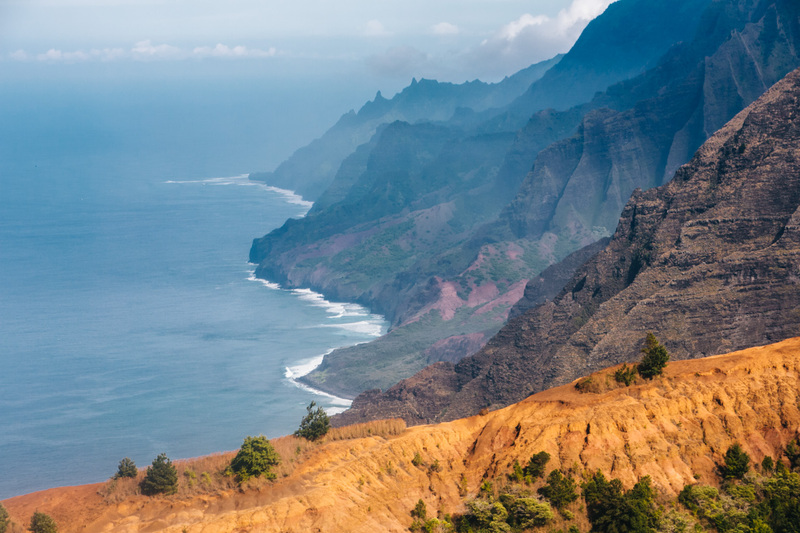 And trust me, you’re gonna want to get up close to Kauai’s natural wonders. 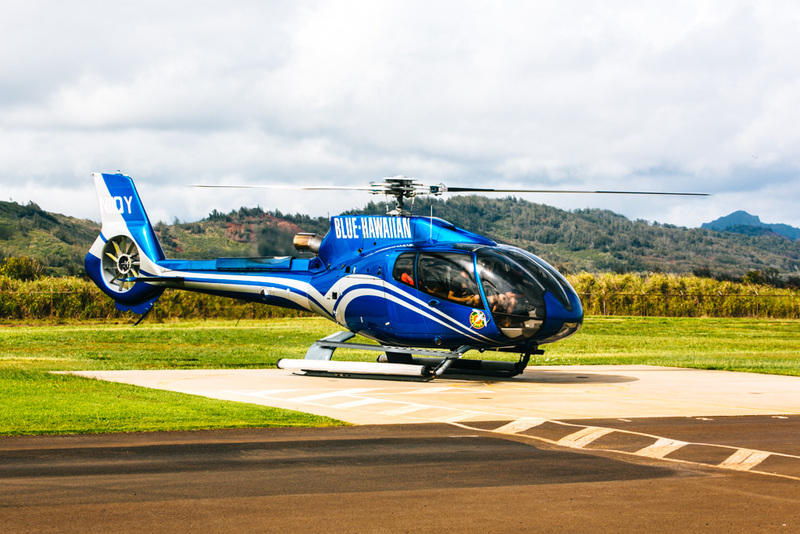 Our 50 minute flight with Blue Hawaiian began in Lihue and headed westward to circle the island clockwise. This is the standard flight path for helicopters, which means that you’ll predictably see them passing by overhead all day long, wherever you are on the island. Our pilot informed us that all of the scenic flight operators stagger their take-offs so that you aren’t too close to any other aircraft. 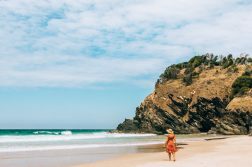 It felt like we were the only ones around – but then again, it’s entirely possible I was just so entranced by the scenery that I was oblivious to everything else around me. Can you blame me? 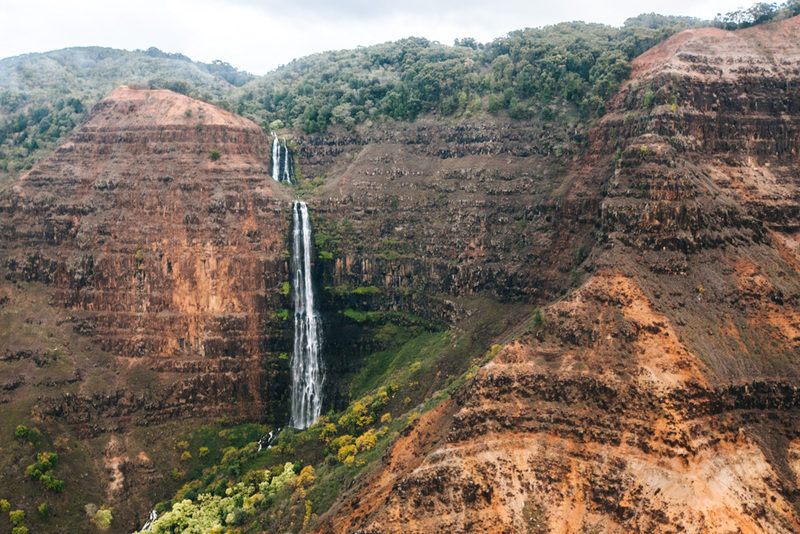 Kauai is nicknamed The Garden Isle, but personally I think it would be better suited as The Waterfall Isle. 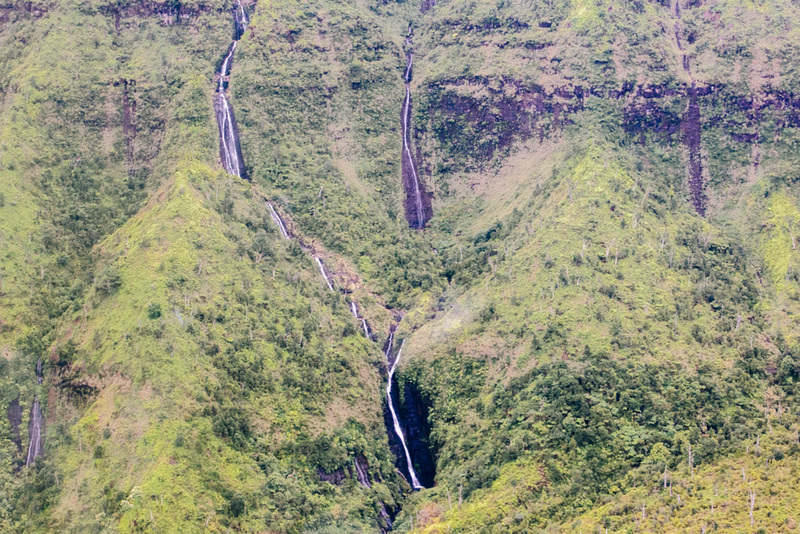 Most of the falls you can’t even access on foot because they’re nestled in the mountainous jungle. The only way to see them is to fly over them. 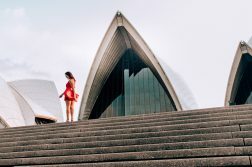 I’m prone to sporadic motion sickness, which basically means that sometimes I feel completely normal in a moving vehicle or vessel, and other times I feel extremely nauseous. There doesn’t seem to be much rhyme or reason as to when it hits me. I had packed some ginger tablets with me on my Kauai trip but of course they were nowhere to be found when I was frantically searching for them while parked in the Blue Hawaiian parking lot. I probably should have spent a little more time looking because YUP, the motion sickness monster ripped me a new one. Thankfully I didn’t actually get sick, but I was pretty out of it for most of the flight. Another woman in our helicopter also felt nauseous, so I know I wasn’t the only one suffering. We think it was the constant circling and turning around the chopper did so that passengers on both sides could enjoy the same view. Great in theory, because what’s worse than being on the wrong side of the plane when flying over some miraculous landscape? But not great when all that circular motion triggers nausea, as it tends to do for me. 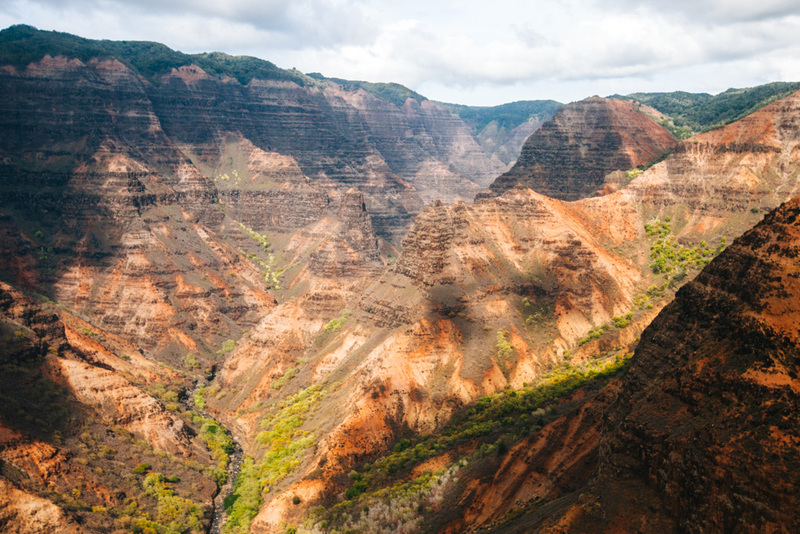 Waimea Canyon: The Grand Canyon of the Pacific. I can totally vouch for this claim now that I’ve witnessed this stunner from both the air and the canyon rim. A wide angle lens is key for this portion of the flight. I didn’t get too many shots of it because I didn’t have a window seat and couldn’t get close enough to the window to take them with my 16-35mm lens (and also because I was feeling the worst of the motion sickness, ugh). Blue Hawaiian’s helicopters seat 6 passengers: 2 in the front (aka best views) and 4 in the back. They guarantee one window seat per “couple”, and assign seats based on weight. Ours were in the back-right of the chopper. I let Anna have the window seat because she wouldn’t have been able to get many shots with her phone otherwise, and figured I would take most of mine with my 70-200mm zoom lens which would actually work better with more distance from the window. 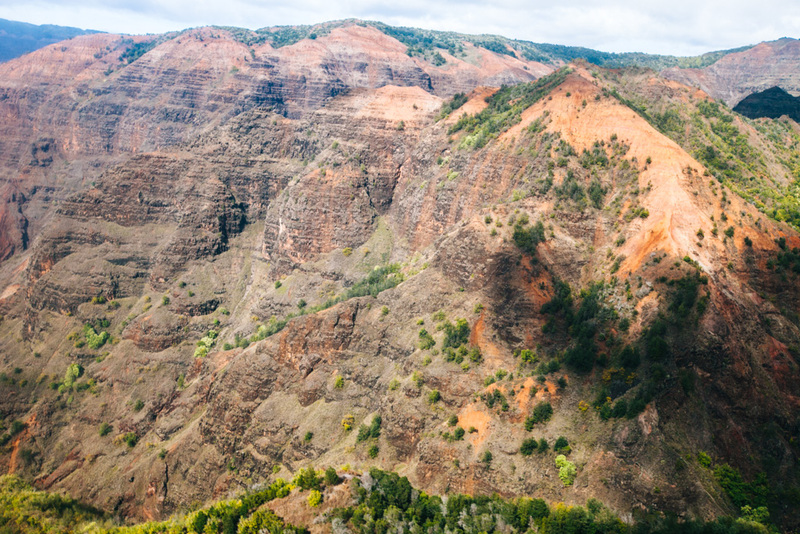 The zoom lens was perfect for capturing those up-close waterfall shots and coastal views, but I think Waimea Canyon is better suited for a wide angle lens. 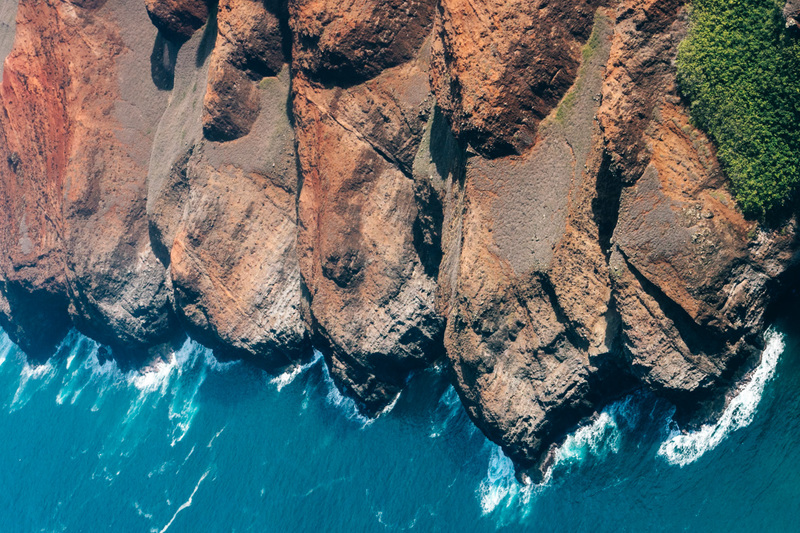 And then, the most highly anticipated part of the Kauai scenic flight: the Na Pali Coast. Oh my sweet baby Jesus, this coastline is breathtaking. 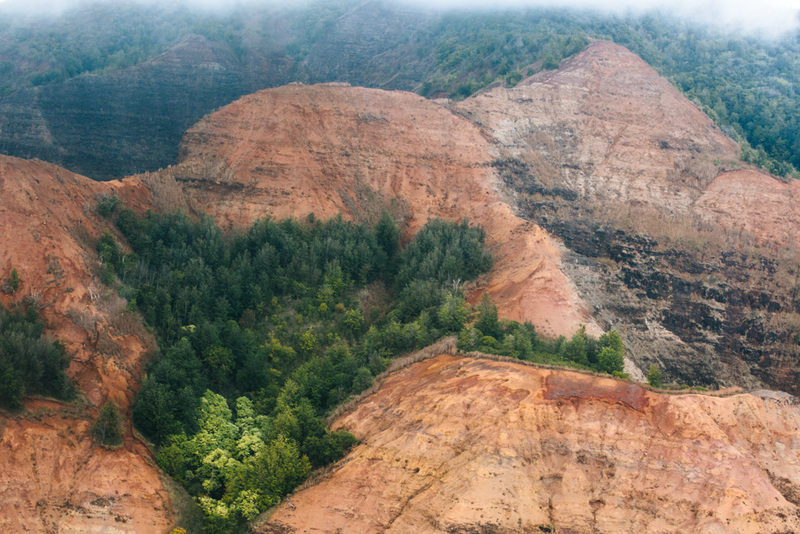 THIS is why you book a Kauai helicopter tour. 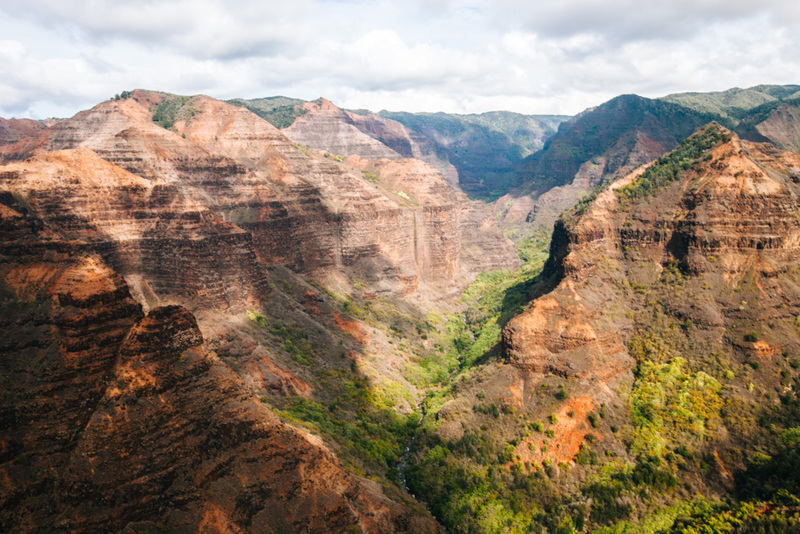 I was particularly excited to see the Kalalau Trail from above, as I’d be starting the trek in just a few days time. See the beach in the photo below? 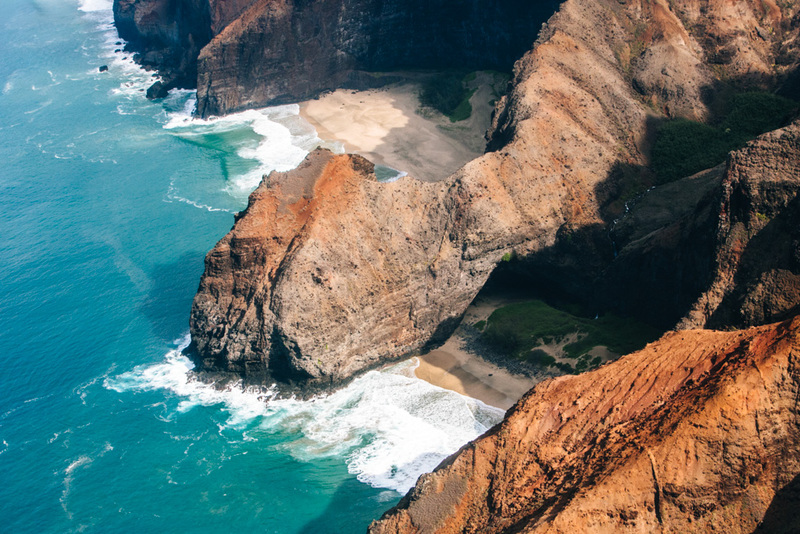 That’s Kalalau Beach, where I’d soon be camping and frolicking. 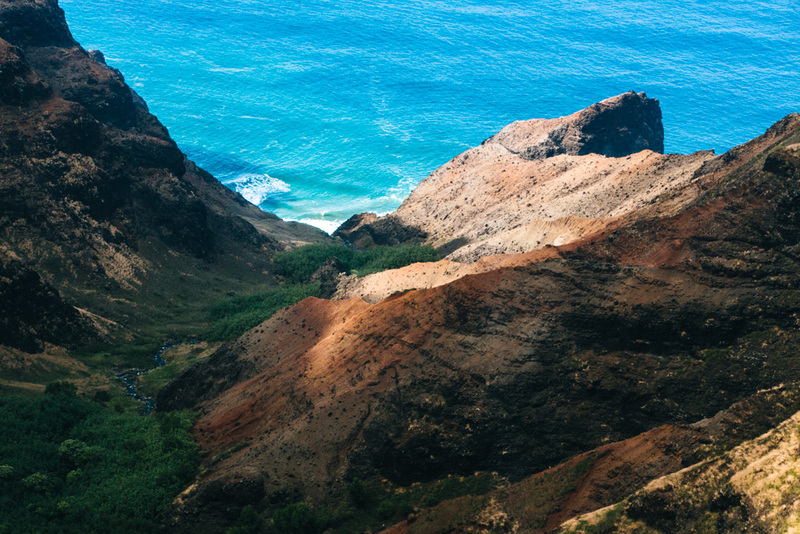 The coastline north of it is where the Kalalau Trail runs. 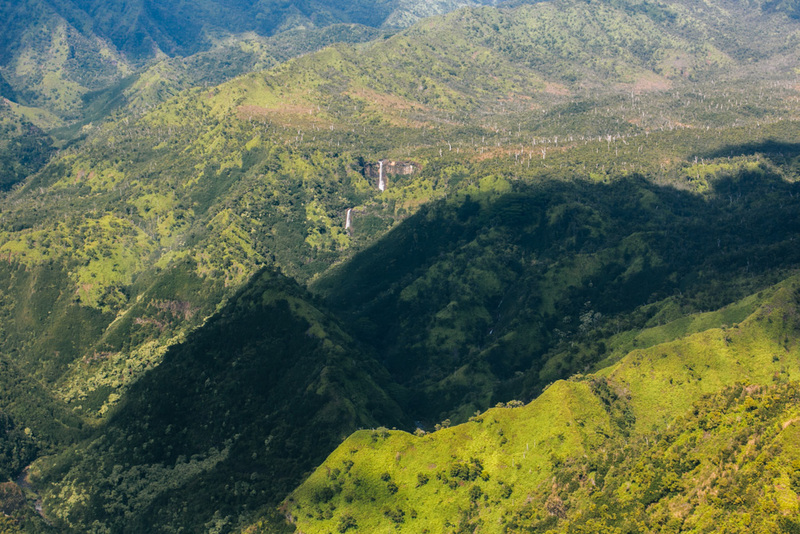 Our pilot flew between the ridges and took us into the valley, where we got super close to a waterfall and spotted some goats amongst the ridges. I have minimal photos from this part because all the manoeuvring and turning made me feel sick. 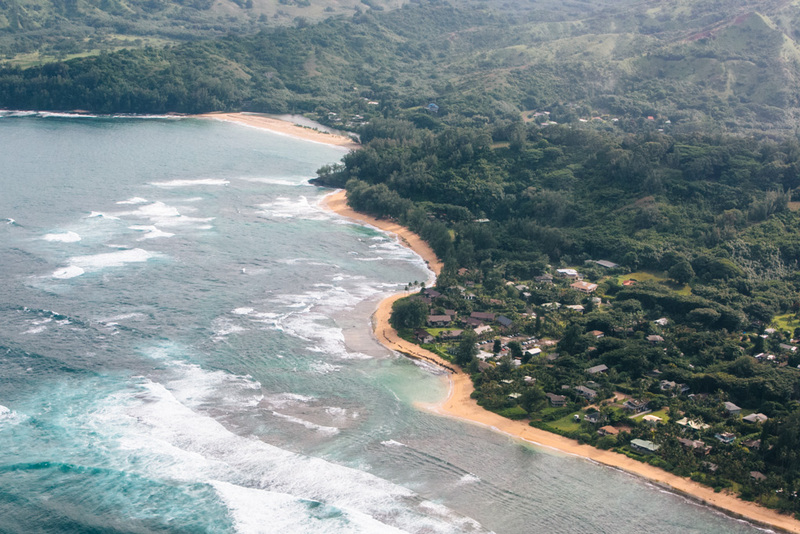 From there, we turned and flew along the North Shore and then headed back inland to Lihue. I think this coastline would have been far more epic on a sunny day where the water would have been bright blue, but honestly: I was too dizzy to enjoy it anyway. The verdict? 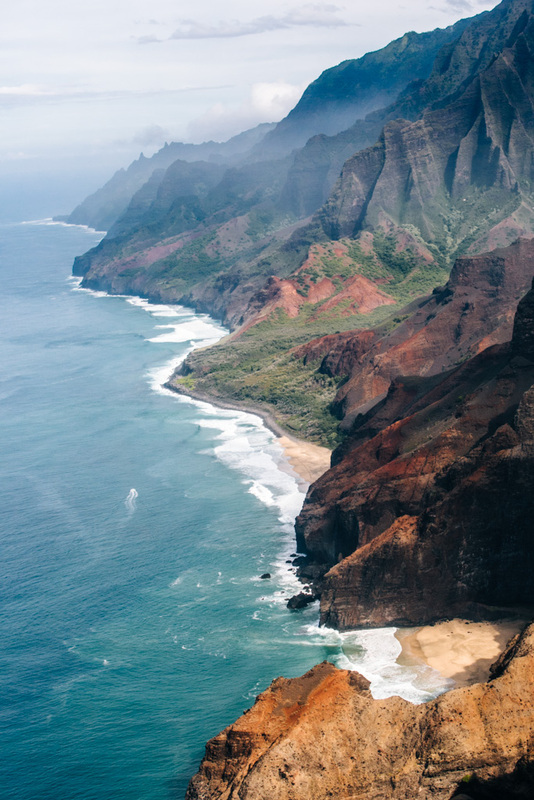 I’d say our Kauai helicopter tour was absolutely worth the price, despite the motion sickness I endured. One thing I will say is that it did feel a bit like we were on a conveyor belt throughout the whole experience with Blue Hawaiian. 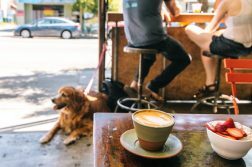 They were constantly having us move here or stand there and it felt very formulaic and impersonal. I guess it works well when you have a large volume of customers coming through – gotta be a well-oiled machine to make it work! But I feel like they could make more of an effort to make their customers feel special. Isn’t that what we all want? We also never received any email after we booked to confirm what time our flight was. We got the receipt just after booking, but nothing after that with further details after we’d stated our preference for an ‘afternoon’ flight. So having to chase that information down a few days beforehand was kind of annoying. 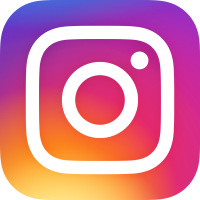 Note: I paid full price for my helicopter tour and was under no obligation to review my experience, but as always I wanted to be honest about it. 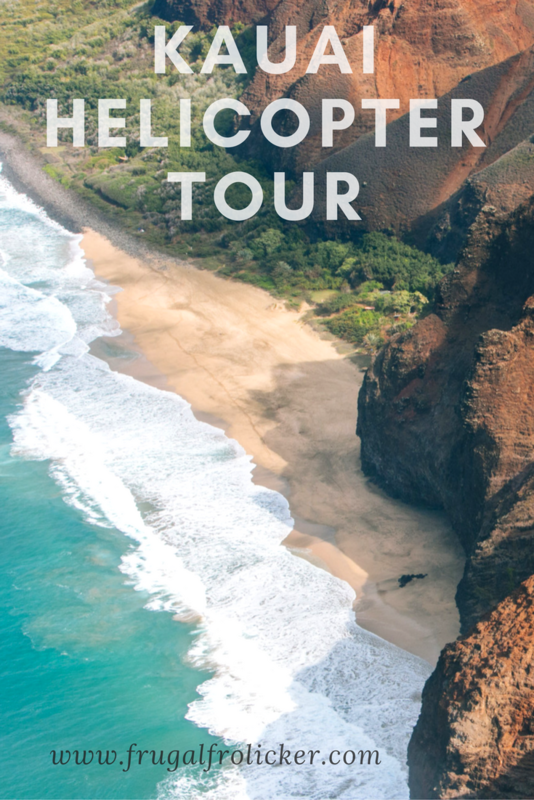 The Kauai ECO Adventure helicopter tour with Blue Hawaiian costs $217 if you book it online at least 5 days in advance; $246 otherwise.